Though there is some debate about the origin of the name Galloping Ghosts, we do know that the Galloping Ghosts came to be in the 1920s. 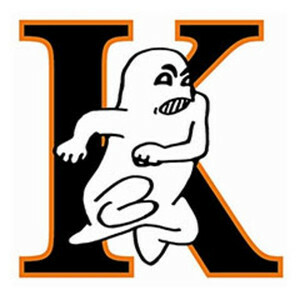 The first: A sports writer for a local paper promoted the name of "Ghosts" for Kaukauna's football team in one of the articles he wrote. The writer had predicted a Kaukauna win over the Appleton Terrors based on the fact that Kaukauna was lighter and would trample Appleton with our speed. This game was played on Halloween and Kaukauna was dressed all in white --- looking like a large group of ghosts galloping over Appleton. The other story: “Tiger” Bill Smith, a recent graduate of Lawrence College in Appleton, was hired to coach Kaukauna's struggling high school football team. He motivated the team and especially his lighter than average (but speedy) running backs to emulate Red Grange's (who was known as the Galloping Ghost) goals and accomplishments. The phantom horse and rider galloped into KHS tradition about 1940 when a student cloaked himself and his horse in bed sheets and thundered onto the football field to present the opening game ball to the referees.